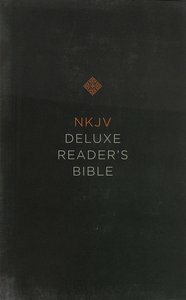 About "NKJV Deluxe Reader's Bible Yellow/Gray (Black Letter Edition)"
Thomas Nelson's Deluxe NKJV Reader's Bible is an invitation to linger with the story of God and His people, to engage timeless wisdom, and to encounter the voice of God. The beautifully designed, single-column text features line matching and custom fonts, bringing balance to every page and making reading a pleasure. Narrative, poetry, and correspondence come alive without the distractions of verse numbers or footnotes. And the New King James Version, known for its literary excellence, is the perfect Bible translation for anyone who loves to read.